For the first time, Taco Bell will be opening their test kitchen in to the general public via a very limited number of reservations available through OpenTable.com. If you manage to reserve one of 32 available seats, the dinner will feature "twists on Taco Bell favorites, never before seen products, and menu creations before they are available to the public." The test kitchen is located at the chain's headquarters in Irvine, CA. While the reservation and dinner are free of charge, you'll have to foot the cost of making it out to their headquarters on your own. Taco Bell will reveal the reservation URL on Cinco de Mayo for a exclusive meal set for Friday, May 19, 2017. Attendees must be 21 or older to make reservations (which makes it likely that they'll be serving alcohol with the dinner). Details will be available on the reservation URL once it goes live. The chain plans to add a series of future reservation-only events throughout the year in the same manner. As someone who has been to Taco Bell's test kitchen on several occasions, I would guess the dinner might be a little like this mixed with some of this (or maybe the experience will be more like Conan's). 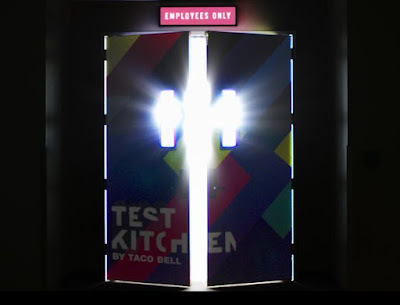 If you're curious as to how Taco Bell headquarters and the test kitchen is like, you can check out my grand tour here.